>> See other Miller & Schneider items. The C-Cup is a traditionally shaped eyecup designed to fit perfectly to the Canon C100, improving the camera's electronic viewfinder and overall ergonomics. The C-Cup is designed to look and feel like an extension of the camera. It can be used with either eye, providing a comfortable, flexible cushion to push against and a solid third point of contact. It wraps around the eye to block out light, and it doesn't disrupt the camera's shape or balance. Simply put, the C-Cup allows you to comfortably use your C100's EVF so you can fully take advantage of the camera's excellent form-factor. Miller & Schneider stopped producing the C-Cup in 2016 after the Canon C100 was discontinued. 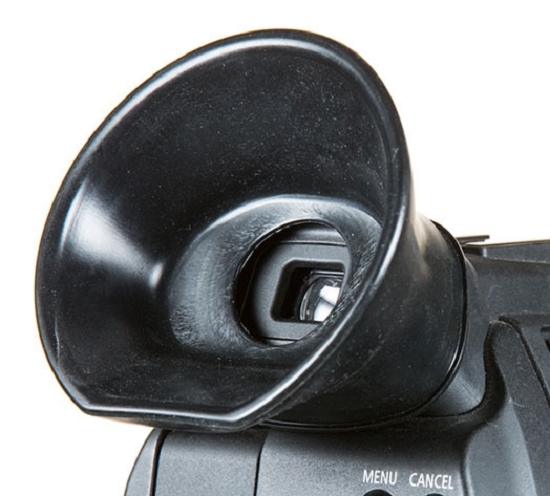 The C100 Mark II, the current model as of November 2016, does not require the use of this adapter.